I talked about my ideal summer style a few weeks ago. This is one variation on the type of outfit I've pretty much been living in for most of the season. The idea of it is simple enough just as the components are easily interchangeable. I own two vintage denim midi skirts and this one gets the slight edge because it has pockets. And I may need an intervention when it comes to striped shirts but I can't get enough of them. This Gap top actually combines my love for stripes and polka dots at once. Most of my sandals are metallic as I consider them neutrals. These Worishofer's are quite stylish for German orthopedic sandals. The Louis Vuitton crossbody was my Mom's. She gave it to me years ago but I only started to actively use it more recently. I find jewelry uncomfortable when it's hot so I just pare it down to a necklace and it doesn't always have to be a statement one. The sunglasses and hat are a no brainer for sun protection. Some of you have asked me about outfit posts and this is probably as close I'll get for now. They're just not my thing which explains why I've done exactly one since the start of this blog. 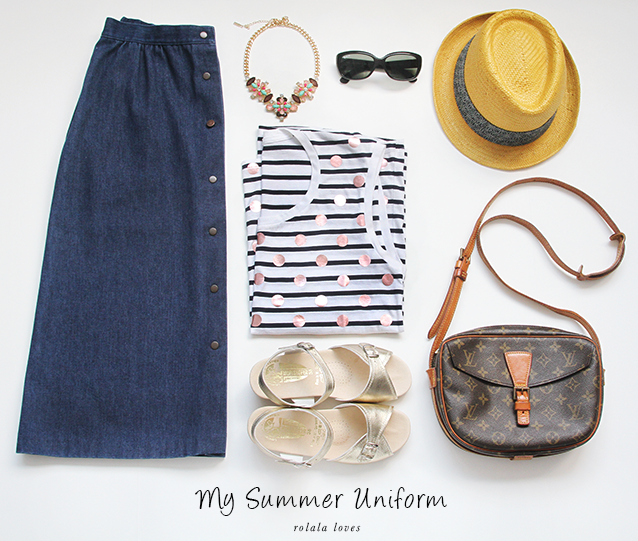 Do you have a summer uniform? I've started posting Eye Candy Single Shots on my Facebook page. This is for when only one photo in an entire editorial catches my eye. Since I wouldn't devote an entire post to a single image and still want to share these, I thought this would be a good way to do that. The first one features a totally glammed up Park Shin Hye. Dear Rowena, this is my summer uniform too, I mean when I'm not at work :-) have a lovely day! Cute look!! Perfect for summer! Nice uniform for the summer cool fedora. ok seriously how do you pull off that set? I could never pull off a print like that! That’s a really cool look! ooooohhh looks like summer is looking real interesting for you there *_^ I love the necklace and the sunnies! hope you are enjoying your summer time! You have such chic style Rowena, loving those metallic sandals, its something Id like to wear and the skirt is very cute. Thanks for your fashion input…Have a great start to the week! Rowena, the LV bag certainly caught my attention cause I'm a huge fan of the brand! I think this is a really cute outfit. The accessories are spot on! This is the perfect Summer outfit, love it Rowena! Chic summer look!! Love the stripe. Perfect and absolutely cool Rowena!!! very cute rowena! i love that length of skirt! i need to add more skirts to my wardrobe. dresses and skirts are so easy. i keep jewelry to a minimum too. i've tried statement pieces, but i can't wear them everyday. love your straw hat! that's essential for me too. great outfit! The outfit looks really great and comfortable. this is so sweet! I love the polka dot top! SO lovely! 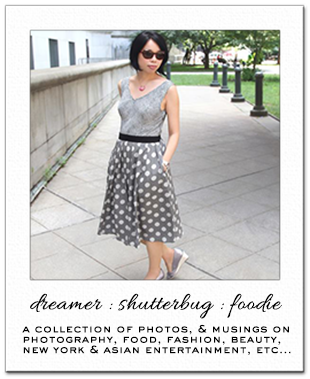 I adore that vintage midi skirt, and that stripes and polkadot mix shirt is just darling! I know what you mean—I can't wear a lot of jewelry or bulky pieces in the summer heat. I usually just stick to delicate rings and maybe a small necklace. My ideal summer uniform is a flowy, loose-fitting dress. Great for those hot days when you don't want tight clothing restricting/sticking to you! I love that yellow hat! It's the perfect look with the striped top. Oh that tank/tee is so cool, stripes, polkadots and metallics all in one! Your style is perfect. And may I add that I absolutely love that top! Sweet summer outfit! I love your photography! Headed over to your Facebook page now! Love your summer uniform. I love stripes too, just something about them that I can't get enough of. Chic and yet casual the perfect summer outfit. Awesome hat. That is such a gorgeous summer look. I love the striped top with the polka dots. A great way to combine two patterns. Looks like a fabulous outfit for summer - I always like wearing stripes and spots. Super cute look! I can never pull off that hat but I love it! Now following you on Blog Lovin! I just love nautical stripes! Cute collage! I really like the pieces you chose. What a fabulous statement necklace and your summer outfit looks so practical too. I wish the sun would return here - there's so much rain! Stripes and metallic polka dots! We are in love!! You created a very nice outfit! Love the LV bag.